A rainy Monday is the perfect kind of day for a blanket, cup of tea, and a good book...in my day dreams of course! Still, doesn't it sound like a lovely way to pass the day? Today's card is a technique I taught at this month's card class called Direct to Paper. The process and tools required couldn't be simpler - just your ink pads and the ability to smear ink across paper! Be warned; its a very impressionistic technique so if you require lots of structure this one might not be for you. Although, once you give it a try you'll probably find it quite addictive! I hope to work on a photo tutorial for this technique in the near future, but for now I'll quickly take you through the steps I used to recreate this sunset. I began working from the center of the Whisper White cardstock outwards. I smeared a small amount of Daffodil Delight in the very center of the paper. I then added Crushed Curry around the outer edges of the Daffodil Delight, followed by Pumpkin Pie around the Crushed Curry. Melon Mambo then Raspberry Ripple were added from the edges of the Pumpkin Pie all the way to the edge of the paper. At this point the upper 1/3 of the cardstock should still be white. Smear Soft Sky on the remainder of this white space, followed by Bermuda Bay then Island Indigo. 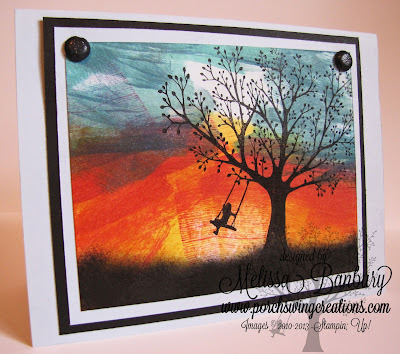 Stamp the tree image from Forever Young in Basic Black and sponge the ground line with Basic Black as well. Truly a very artistic technique that you can do so much with! Mountains, fields of flowers...give it a try today! Dazzling Wildflower Meadow & New Catty Time! May 2013 Virtual Club Tutorials Available!